Back at the Hall this week and a good turnout despite of the 'summer' weather i.e. Throwing it down. A good mixture of games going on. 40K Planetstrike, Zombies!!! (with expansions), Uncharted Seas, AK-47 and a game of Svea Rike which I took part in. A three player game, with two experienced players and a newbie, so of course the newbie won with a massive land-grab, normally a bad idea given the number of cards and events that can do over regions. I came second with a large pile of gold thanks to some excessive merchant activity in the final stage of the game. My only chance was if 'War with Russia' happened so as to remove his Finnish provinces, but it never did. Martin trailed in last. No club on Tuesday due to a meeting in the Hall, so a small gathering at Matt's to try and finalise the rules which appear to of morphed into 'SA-80 Monarchy'. Unlike the club drinks and cake was provided; Thanks Matt. The unit list has expanded a lot but still no stats for Routemasters, so how militia are suppose to get around I don't know. Played an unconventional (for AK-47) 2 vs 2 game with equal point forces on an over-sized table. Lots of tanks and mobile units on the board. Much querying over the effectiveness of artillery as it did seem powerful as it could standoff and blow the toughest tank apart with some ease. We didn't play the official encounter rule so it was more like a conventional wargame with forces and reinforcements approaching from two sides, rather than AKs more usual popping up at a chosen corner or side. This gave the guns a lot more security than what they would normally have. Despite this the guns are being tuned down a bit. 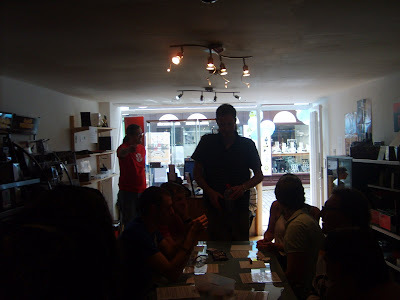 People were thin on the ground this week with only three tables up and running. Fought a couple of battles as a group of oldtime gamers may have finally found a use for their old 70s\80s Cold War stuff. A proposed campaign on a later day Britsh Civil War (they claim that they've never heard of the 30's based campaign 'A Very British Civil War' but the ideas are very close). So I got drafted to do a couple of trial games using the original AK-47 rules. First game I was the defender, second the attacker. In both cases the defenders position was nerfed by poor setup roles, weak armoured car forces trying to fend off tanks. Both ended in the attacker holding two out of three objectives (40pts vs 20pts) but unable to do the clean sweep as in both instances the clock ticked down rapidly. Ideas for tweaks are already being collected to shift the setting into more in line with 1st world conflict rather than 3rd world bush wars. Phil's games store has finally opened in Ulverston. 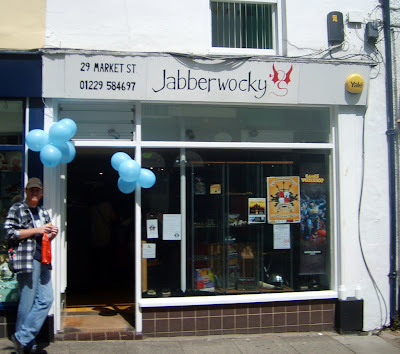 Jabberwocky Games is no longer just a website, but is the first dedicated games shop in Furness since System Games in the early 90's. A bit of a brave thing to do given the economic climate. Missed the grand opening and apparently a good job too as supposedly the store was packed. Things were still a bit sweaty when I turned up at 12.15. The usual suspects turned up as can be seen above with Colin guarding the entrance. For some reason all the old dears walking past kept chatting to him asking him what's it all about. 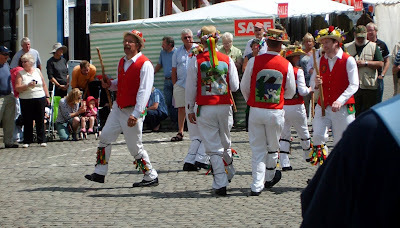 They even had Morris Dancers and Folk Singers laid on, but I think that might of been something to do with the local Folk Festival. Finally broke and went on a bit of a spree. Bought the Uncharted Seas revised rulebook and Thaniras Elves starter fleet (with free blister pack), and the Race for the Galaxy boardgame. Also got an opening day discount and a free pair of Jabberwocky dice! The Uncharted Sea stuff was selling quick and along with Flames of War probably made up the majority of sales. Seas definitely seems to be the in thing at the moment. Graeme was demoing it at the back of the room in sauna like conditions. Somehow, despite a poor fantasy round, the FW team managed to win the Sci-fi\Fantasy quiz gaining Jabberwocky tee-shirts in the process. I was surprised that I was the only one on the team who knew who Thulsa Doom was. And also the only one to recognise the funky first series theme tune for Space1999. What is this and other worlds coming to.